The Heroes Discussion Group returns!! Thanks to all of you who have requested we continue this delightful endeavor. What is it? We select a graphic novel and on a scheduled Saturday afternoon we meet at Heroes Aren’t Hard to Find and then repair to a local watering hole (or bakery). There we eat, drink and have a full blown discussion about the book we’ve selected. Our mission is simple: How often have you read a terrific (or really bad) comic and wanted to discuss it and for one reason or another, you could not. We offer a forum where every one is on the same page and we do our darnedest (pardon my French!) to keep the discussion on track for a few hours. In the past 4 years (!) and almost 50 meetings, we’ve tackled every kind of comic book from Maus to Scott Pilgrim to From Hell to The Walking Dead to Sandman to All-Star Superman. The discussions are always lively and above all fun! For our re-inaugural, we thought we’d try something a bit different. We want to examine a series that is currently on-going and (obviously) unfinished. The book is Saga written by Brian K Vaughan and drawn by Fiona Staples (what a great comic book name!). SAGA is currently one of the best-selling comics and it is certainly the most buzz worthy outside our four-color world. We will be discussing the first 13 issues— which have been collected so far into 2 trades (with 13 a single issue). As always, Heroes is offering the 10% DISCUSSION GROUP DISCOUNT on the two trades as well as #13. But as an added incentive, if you purchase both collections and #13 at the same time, we are offering you the package for only 24.00!!! REMEMBER to inform the clerk of the discount when you check out!! How does the artwork and especially the coloring sets the tone for the story? Can this kind of sub-textural investigation help or hinder a readers experience? What sets Saga apart from all the other Sci-Fi and Fantasy books that are being published. Where do you see the book going in the months ahead? Does a book like Saga (or any other comic for that matter) benefit from ‘binge’ reading as opposed to reading each issue as it is released? And lots and lots more….. 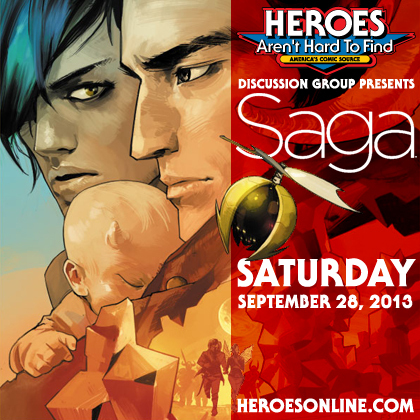 If you are a big fan of Saga or if you dislike it or if you just want to break bread and talk with folks who have like interests, then please consider stopping by Heroes on SATURDAY, SEPTEMBER 28 at 1:00PM. There is no pressure to contribute! You can just come by to listen. All we ask is that you keep an open mind. And if you enjoy yourself (and we think you will! ), mark your calendars to join us on Saturday, November 2ND at 1:00PM as we celebrate a belated Halloween by discussing Hellboy/B.P.R.D. (specific titles to be announced later–but if you have a particular volume in mind either respond on this Blog or our Facebook page!) And for the Yuletide??? We have a wonderful surprise in store.